MetroMax i shelving offers lifelong durability – the strength of steel and a lifetime warranty against rust and corrosion. FUrthermore, Metromax i shelves are built of advanced polymers with type 304 stainless steel corners. Additionally, posts are all-polymer. Also, removable polymer shelf mats and smooth surfaces promote easy routine cleaning and protect packaged supplies from unwanted damage. Finally, Metromax i is ideal for general wet or humid environments, walk-in coolers, sterile areas, and chemical storage. Microban® Antimicrobial Product Protection is built into every shelf mat and touch points – A Metro Exclusive. Microban antimicrobial product protection inhibits the growth of mold, mildew, bacteria and fungus that cause odors and product degradation. Easy-to-clean: Lift-off polymer shelf mats wash easily by and or in dish machines. Robust shelves are designed to function in stationary, mobile, track systems, and wall mount configurations. 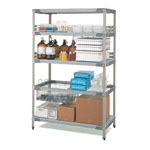 Strong shelving units have maximum weight capacities up to 1000 lbs. (454 kg) per shelf and 2000 lbs. per stationary unit (evenly distributed). Standard 1” (25mm) shelf adjustment assures no wasted space. Sectioned, vented (open grid ) and one-piece solid mat options available. Solid mats have a built-in ships edge to help contain spills. A variety of accessories will help contain, identify, organize, and transport supplies. Corrosion and rust proof, Metromax i has a lifetime warranty against rust and corrosion. Shelves adjust at 1/2″ increments along the height of the posts. Accessories such as dividers and shelf ledges make this system flexible. Removable mats make for easy cleaning. MetroMax i components are interchangable with MetroMax Q components. MetroMax i shelving offers lifelong durability - the strength of steel and a lifetime warranty against rust and corrosion. FUrthermore, Metromax i shelves are built of advanced polymers with type 304 stainless steel corners. Additionally, posts are all-polymer. Also, removable polymer shelf mats and smooth surfaces promote easy routine cleaning and protect packaged supplies from unwanted damage. Finally, Metromax i is ideal for general wet or humid environments, walk-in coolers, sterile areas, and chemical storage. Microban® Antimicrobial Product Protection is built into every shelf mat and touch points - A Metro Exclusive. Microban antimicrobial product protection inhibits the growth of mold, mildew, bacteria and fungus that cause odors and product degradation. Corrosion and rust proof, Metromax i has a lifetime warranty against rust and corrosion. Shelves adjust at 1/2" increments along the height of the posts. Accessories such as dividers and shelf ledges make this system flexible. Removable mats make for easy cleaning. MetroMax i components are interchangable with MetroMax Q components.